Put yourself back in the shoes of a student for a moment. Were you elated on the last day of classes only to realize there was a tidal wave of papers, presentations, and final exams on the forefront between you and your holiday break? Did you stake your claim on the fifth floor of the Murray Library or did you hang out in the hangar room in Thorv? Was playing Kaiser in the Reading Room or taking a walk through Geology your activity of choice for a break? Were you the type of student who spent all day on campus during finals and didn’t have the time to trek away for a mental health break or snack? Now that we’ve set the scene, wouldn’t it have been nice to have an accessible option to give you that extra bit of inspiration? December is accurately one of the most stressful times of the year and a common challenge faced by students new and old is staying nourished and making the time to take a break during final season. The idea to create the first ever “Break Room” located in the heart of the business school began taking shape with these thoughts in mind. Hosted by the Edwards Alumni Network, the goal was to assist students in refueling and re-energizing for finals with fun, food, and coffee. 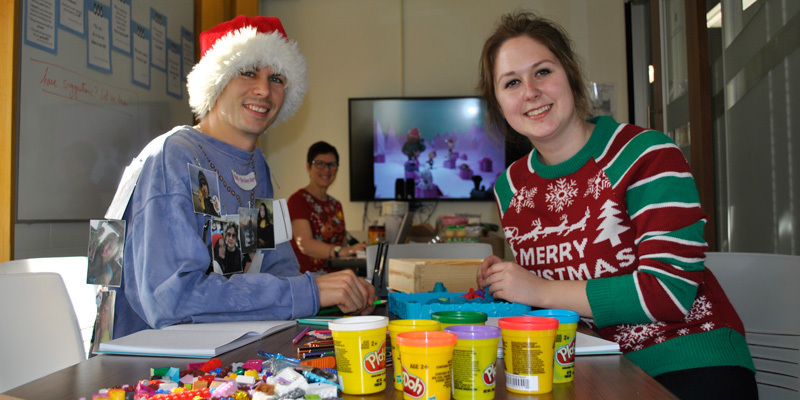 Students were invited to the free drop-in event to grab a snack, take in a stress-relieving activity, and chat with the alumni relations team during this exam season. Organizers said the initiative was well received and word quickly spread among the student body. The alumni connection was also strong with words of wisdom on display from members of the Edwards Dean’s Circle. The Dean’s Circle is a group of business professionals and alumni who pay it forward by providing thoughtful insight to the dean of the business school and contributing time, money and wisdom to innovating student experience. 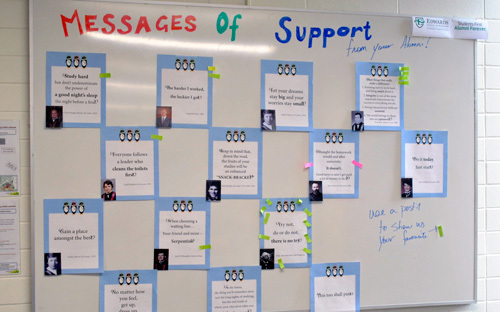 The display of inspirational messages became popular and students were encouraged to vote on their favorite words of wisdom (View a PDF copy). Many who visited commented their appreciation that alumni still care about current students. “It’s a cool idea and I like that the room is personalized for Edwards students with quotes,” commented Ceanna Bruce, a first-year business student. The initiative is sure to expand over the coming years as graduating students are already looking forward to next year when they can contribute their own words of wisdom! For more information or to get involved, please contact Shawna Jardine at jardine@edwards.usask.ca or call 306-966-7539. You can also join the Edwards School of Business Alumni Network at https://edwardsalumni.com.